It’s been one of those weeks. You know, when you start out with the best of intentions… a Sunday trip to the store, a fridge stocked full of fresh food just waiting to be turned into something delicious. And then life happens, work takes over and next thing you know you find yourself eating a LaraBar at your desk at 8 p.m. wondering how long an uncooked whole chicken stays good in the fridge. Does this happen to you? Or is it just me? My problem is I do enjoy to cook, but often my eyes and intrigue are bigger than my tight schedule allows. If it’s going to be a busy week, I try to make a few staples (grains, beans, veggies, etc.) in advance and keep them in the fridge so I can throw something together in a pinch. 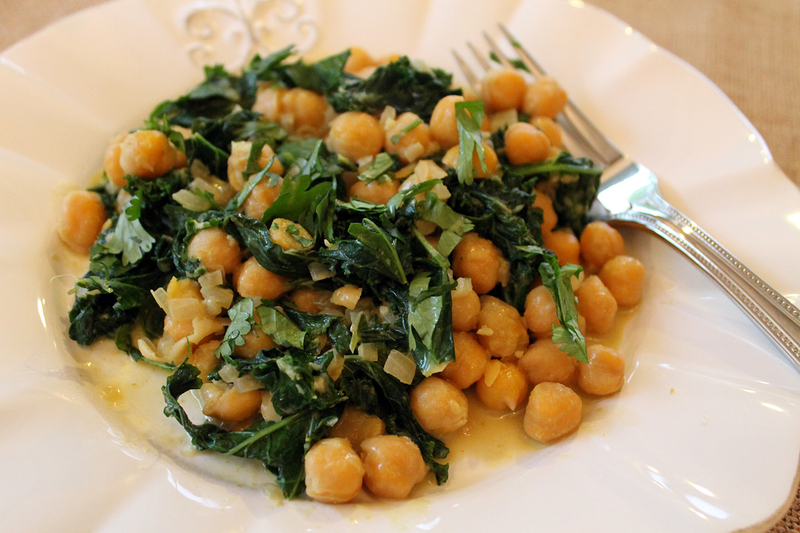 This chickpea recipe is a great one to keep on hand. 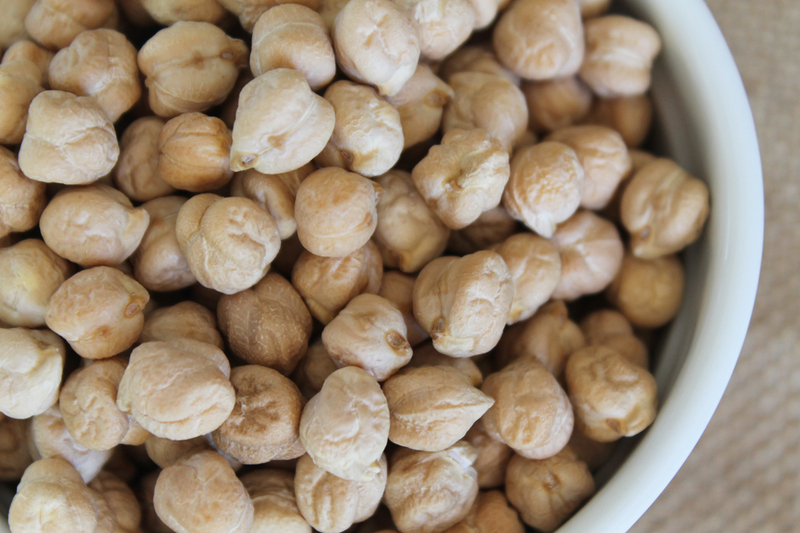 You can use canned chickpeas or make your own ahead of time (they’re so much better, and cheaper too). To turn them into a meal, all that’s left is a little chop and saute and you’re about 15 minutes to done. Simple as a chickpea. Heat olive oil in a large skillet. Add onions and cook until translucent, about 2 minutes. Add garlic and 2 tbsp curry paste. Stir until paste is dissolved into mixture. Add chickpeas, tamari, sweetener and lime juice. You can add water if the mixture becomes dry as it simmers. 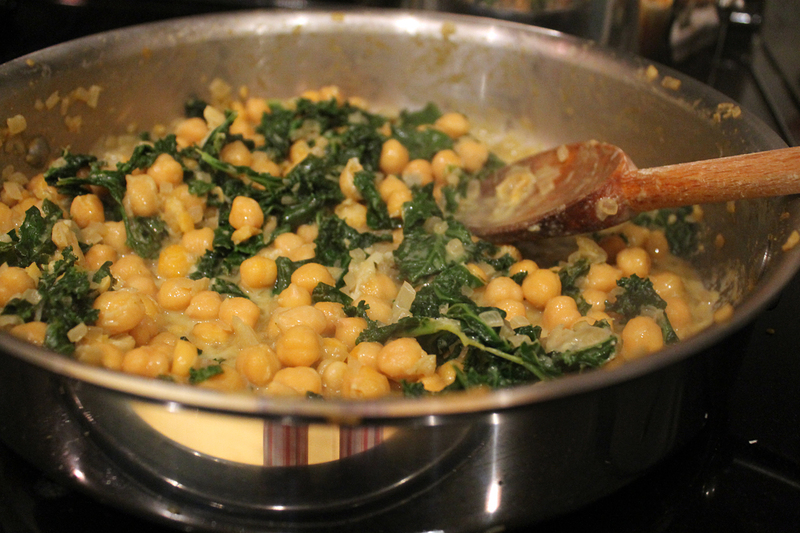 Add kale and stir to mix with chickpeas as the greens begin to wilt and reduce down. Cook for about five minutes, then add coconut milk and warm (not boil) another minute or two. Stir in 1 tbsp curry paste evenly throughout. Serve as is or over brown rice and topped with cilantro. I’ll have to try this…thanks! 🙂 love your blog. Just made this exactly as written and it was fantastic. We felt like we were eating rich coconut soup with really yummy stuff in it. Absolutely delicious. My hubby told me to print this recipe or bookmark it so I will remember to make it again. Love this blog!! !